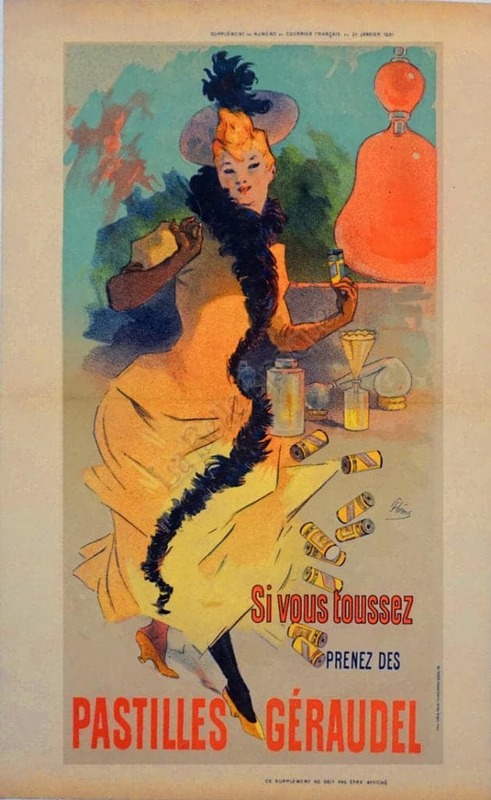 This is a rare French Belle Epoque period advertising poster for Pastilles Geraudel, throat lozenges, created by Jules Cheret in 1891. This poster was created as a second supplement for the Courrier Francais on January 31, 1891. Like many of Cheret’s works, the focal point of this image is an elegantly dressed, carefree woman, an archetype that came to be referred to as a “Cherette.” This Cherette stands in the center foreground of the poster, beautifully dressed, with an elegant pair of gloves and an imposing hat. Behind her are blue and green composing the abstracted background, allowing the yellow of this Cherette’s dress to pop from the poster. On the right hand side of the poster are various odds and ends associated with throat lozenges. This poster has all of the hallmarks of a Chéret masterpiece: bright lively colors, dynamic lines, and a dominant sense of gaiety and vitality. Cheret is a celebrated painter and lithographer who is considered to be the father of the modern poster. Chéret studied both the techniques of various artists, past and present, by visiting the masters seen in Parisian museums and learning the technology of lithography at school. This combination allowed him to become a master artist and brilliant technician who’s work was seen all over the streets of Paris. Cheret’s poster’s became hugely popular and illuminated the streets of Paris. During La Belle Epoque, Cheret caused a color revolution, allowing a sense of fun, fantasy, laughter, and gaiety to dazzle the streets of Paris in a way that had not existed before. In 1890 he was awarded the Légion d’honneur by the French Government for his outstanding contributions to the graphic arts. Today works by Jules Cheret are in the collections of the Art Institute of Chicago, Hermitage Museum in St. Petersburg Russia, The Metropolitan Museum of Art in New York, MOMA, Musee d’Orsay in Paris, and The National Gallery of Art, to name a few.